Coal trains in this era were usually about 100-105 cars built with steel - about one mile long. When aluminum cars began operation in the 90's, train lengths grew to 125-130 cars or more because of the tare weight savings. Newly built Swan Ranch Railroad serves huge industrial park southwest of Cheyenne, Wyoming, USA. 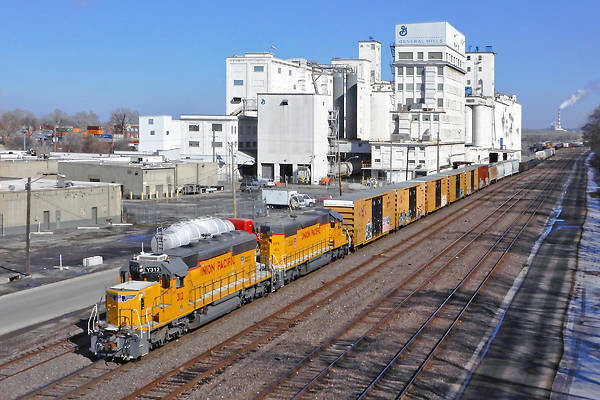 BNSF and Union Pacific Railroad connect to new (2013) industrial development. WAMX 4200 wears sharp Swan Ranch Railroad (SRRR) logo of cowboy on bucking bronco. Logo appears on water tower above Wisconsin & Southern 4050.